Due to its weight, shipments outside of the United States will incur additional shipping costs. Please inquire. �Bandits 10 O�Clock High� is a 1940�s Royal Air Force fighter pilot defending England during the Battle of Britain. 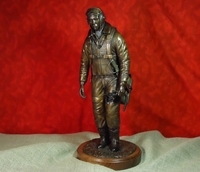 "Bandits 10 O'Clock High", along with the artist's "Vigilance" , and "Tuskegee Airman, Struggle for Victory" are currently on display with the American Society of Aviation Artists 2014 international art exhibit at the San Diego Air Museum where "Bandits.." received an Honorable Mention. Each bronze sculpture is cast separately upon order. 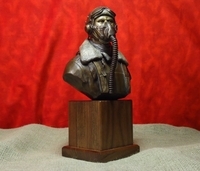 Please allow up to 12 weeks from the time of order for your sculpture to ship. 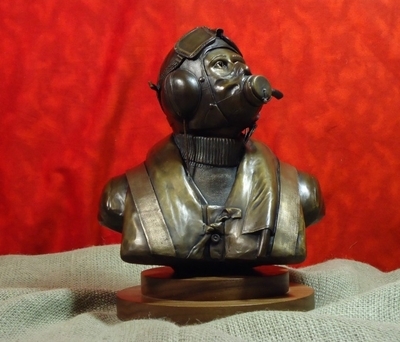 A bronze sculpture is described as either being hot cast (metal) or cold cast (resin). This beautiful sculpture is hot cast. Both types use a mold of the original sculpture (typically clay) which creates an exact copy of the original but with different materials. Hot cast bronze is a true bronze in that it is made from molten bronze metal, mainly using the lost wax process. Bronze metal is a blend of copper and tin along with other metals and is a golden color when cast. The sculptures final color is achieved by applying a patina. "Tuskegee Airman, Struggle for Victory"